In a society obsessed with youth and the fleeting beauty of perfection, Alice Matzkin looks at the positive side of growing older. She paints lines and wrinkles as the story of women’s years. The “Women of Age” series grew out of interviews Alice conducted with women age seventy and older, conversations that allowed Alice to create paintings of women who are living their lives with passion and creativity. In her series entitled “Naked Truth,” Alice depicts women age 58 to 87 without clothes and without shame. On yet a more personal level, in the series “Aunt Kitty,” she depicted her aunt’s tremendous physical change between the ages of eighty-nine and ninety-seven. Aunt Kitty’s gracious attitude about the acceptance of her bodily changes gives Alice and those who study her work more peace about the final stages of life. Alice and her sculptor husband Richard inspire each other and are their best support system. 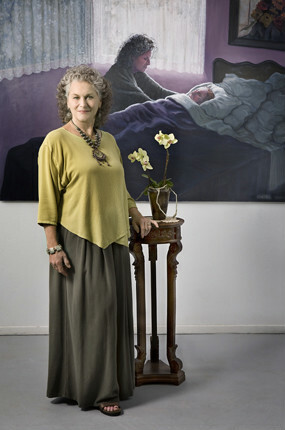 Alice Matzkin’s documentation took place in 2005 and was sponsored by Paula Spellman. The FOTM Archive contains extensive information about this artist.